Pasta with shrimp is a classic and versatile way to whip up lunch or dinner in a flash. Pasta and shrimp are mildly flavored foods and are perfect for savory combinations of ingredients such as tomatoes and basil, olives and chili peppers and onions, garlic and cheese. 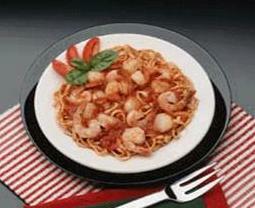 This flavorful pasta with shrimp dish is comforting and savory served warm but is equally delightful at room temperature. In a large pot of boiling, salted water, cook the orzo until almost done, about 10 minutes. Add the shrimp to the pot and cook, stirring occasionally, until both the shrimp and orzo are done, 2 to 3 minutes longer. Drain thoroughly. Shrimp and champagne? Sounds elegant doesn't it? This lovely pasta with shrimp is too delicious to save for a special occasion. It's easy enough to serve any day of the week. Saute mushrooms in medium saucepan in hot olive oil over medium-high heat. Cook mushrooms until the juices are released and then evaporate. Remove mushrooms and set aside. In same saucepan, combine shrimp, Champagne and salt. Heat to simmer until shrimp are just pink. Immediately remove from liquid with a slotted spoon and set aside. Add chopped shallots and tomatoes to cooking liquid. Boil over high heat until liquid is reduced to about 1/2 cup, approximately 8 minutes. Add 3/4 cup heavy cream and boil 1 to 2 minutes until slightly thickened and reduced. Add shrimp and mushrooms to sauce and add salt and pepper to taste. Cook pasta according to directions on package. Drain thoroughly and return to cooking pot. Toss with remaining 1/4 cup cream and parsley. To serve, divide pasta among four plates. Spoon shrimp and sauce over pasta. In a medium nonstick frying pan, heat the 2 tablespoons oil over moderate heat. Add the bread crumbs, garlic, and 1/8 teaspoon each of salt and pepper and cook, stirring frequently, until golden, about 5 minutes. In a large pot of boiling, salted water, cook the pasta shells until almost done, about 10 minutes. Add the shrimp to the pot and cook, stirring occasionally, until both the shrimp and the pasta shells are done, 2 to 3 minutes longer. Drain thoroughly. In a large glass or stainless-steel bowl, whisk together the lemon juice, anchovy paste, Worcestershire sauce, and 1/4 teaspoon each of salt and pepper. Add the remaining 1/2 cup oil slowly, whisking. Cook orzo in boiling water for 8 minutes; drain and set aside. Spray a skillet with cooking spray and saute garlic just until soft. Add green onion and pimiento and continue cooking just until onion is softened. Add shrimp and saute a little longer until shrimp are heated through. Add orzo and sage leaves; stir well and cook until sage is slightly limp. Season with salt and pepper. Serve with shredded Parmesan cheese.